Mushrooms sauteed in butter transform from bland and rubbery to soft with a subtle, nutty flavor in a matter of minutes. Use this basic technique to soften mushrooms for cream of mushroom soup or to top a sizzling hot steak, using mushroom varieties such as white mushrooms, portabellas or chanterelles. Sliced or minced mushrooms brown are easy to brown evenly, but you can also cook small, whole mushrooms with this method. The key to successful sauteing is allowing the mushrooms to rest long enough to turn brown without sticking to the pan or burning. Melt the butter in a skillet over medium heat until it begins bubbling slightly. Melt roughly 1 tablespoon of butter for every 1 pound of mushrooms you wish to cook. Spread the mushrooms evenly in the pan and add spices such as salt and pepper to taste. Stir the mushrooms to coat them evenly with the butter. The mushrooms quickly absorb the butter in the pan, but there's no need to add more butter. Stir frequently while cooking for about 3 minutes, or until the mushrooms begin to release their moisture, leaving a bit of juice in the bottom of the pan. Turn the burner up to high heat to cook off the excess water. Saute the mushrooms for roughly 7 to 10 minutes more, stirring about once every minute to prevent sticking and ensure even browning. 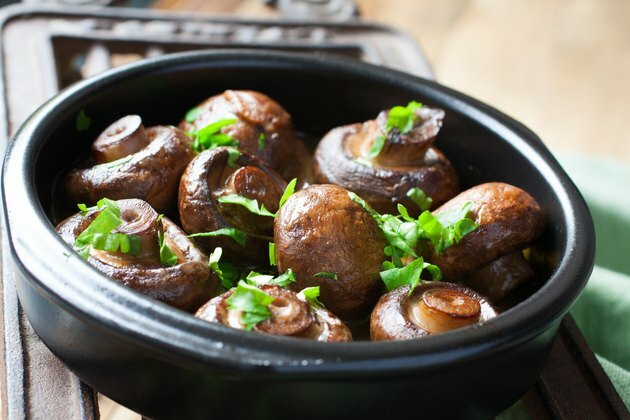 Remove the mushrooms from the skillet when they are evenly brown. If you want to saute mushrooms and onions together, add the onions to the skillet first. Toss in the mushrooms just when the onions begin to sweat -- release their moisture -- and soften.